The Tao of Gini: and the correct definition is???? and the correct definition is???? DRAG SUIT: What is a Drag Suit? 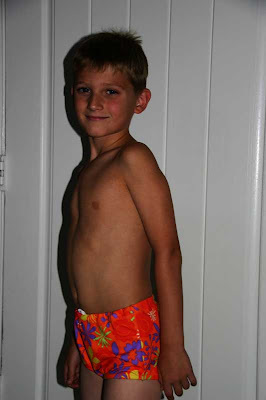 A drag suit is a bathing suit that provides an increased amount of water resistance. The increased amount of water resistance makes it more difficult to swim fast. Drag suits can be worn over normal swimsuits or by themselves. Why use a Drag Suit? A drag suit will help increase your swimming speed and endurance. Drag suits are usually used only for training purposes. Here is Connor in his new drag suit. 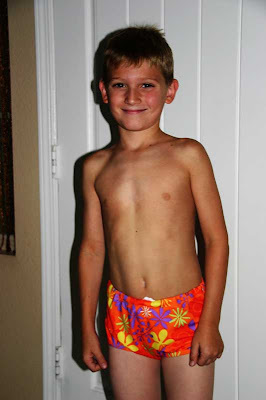 His definition: A really cool looking suit that all the bigger, fast swimmers wear, and that he just wants to be cool and fast like all of them. Yes, it has a girlie print, but if all the cool, fast boys are wearing them, it is so OK.
And as I was photoshopping these pictures, he said "Wow, I look good!" His definition is the right one. Okay, so another definition came to mind when seeing that print and the name "drag" suit! You so need to save that and bring it out on his wedding day! Too funny! I think this suit will make him win because everyone else will slow down while they are thinking "hmmm... is that color melon? Or hot pink?" Good job Connor, REAL men aren't afraid to wear pink. Wow! What a suit! I agree, Connor - you look good! BTW, have you seen the Speedo LZR suits? Those things are crazy!